While there are snakes that have been shown to be territorial in an ecological context, such as Taiwanese kukrisnakes which defend sea turtle nests (citation below), territoriality in a sexual selection context has never been demonstrated in a snake. Until now. 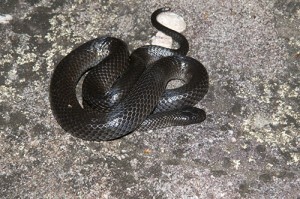 Jonno Webb has been studying broadheaded and small-eyed snakes in Morton National Park, New South Wales, for about two decades. We know from Jonno’s field studies that snakes occur under particular types of rocks that vary in temperature and which are a discrete resource. When males monopolise a rock shelter, they are also able to monopolise any females sharing that shelter and this is the basis for territotiality to evolve. This work has recently been published in the journal Behavioral Ecology and Sociobiology and follows from Mitch Scott’s earlier work that we published in Animal Behaviour. Territorial behaviour, whereby dominant animals gain priority access to critical resources, is widespread in some animal lineages, but rare in others. Theory suggests that territoriality will evolve only when animals can economically defend sites that contain critical resources (typically mates, sometimes food). In striking contrast to their close relatives the lizards, male defence of territories for access to mates has not been reported in snakes. In south-eastern Australia, receptive female small-eyed snakes thermoregulate under hot rocks, concentrating mating opportunities and thus, potentially allowing males to enhance their fitness by defending these rocks from rivals. We videotaped staged contests between resident and intruder males and analysed data on cohabitation patterns from a long-term (21 years) mark-recapture study. In staged contests, males actively defended hot rocks from intruder males; and thus, larger males actively displaced their smaller rivals. In the wild, larger males were found under rocks with more or larger females. These results suggest that the thermally driven concentration of female small-eyed snakes has rendered hot rocks economically defensible, and thus favoured the evolution of territoriality in a snake. Webb, J.K., M.L. Scott, M.J. Whiting, and R. Shine. 2015. Territoriality in a snake. Behavioral Ecology and Sociobiology 69(10): 1657-1661. DOI 10.1007/s00265-015-1977-y. Also see this paper: Huang WS, Greene HW, Chang TJ, Shine R (2011) Territorial behavior in Taiwanese kukrisnakes (Oligodon formosanus). P Natl Acad Sci USA 108:7455-7459.